We now explain the most important terms used in this book. An arrow → indicates a key word which is explained elsewhere. In most cases, the origin as well as the original meaning of a term is mentioned. (Latin ad = to, absurdus = absurd; non-sensical): When an idea is pursued "ad absurdum," one demonstrates the nonsense of an idea; used to show the absurdity of a statement. (Greek agnosía = no knowledge): The doctrine that reality is unknowable. In particular no knowledge of God is obtainable. (Greek allegoria = to say differently): Abstract ideas are represented in a personified way, with symbolic and didactical meanings. Examples: Death is represented as a man with a scythe; justice as a blindfolded woman with scales (Justitia). (Greek allo = foreign and hormones): Chemicals that serve as signals between individuals of different kinds. This means different kinds of animals can coexist peacefully (symbiosis). Example: Blue butterflies (allotinus unicolor) and certain ants (anoplolepis longipes) accept one another. The ants "domesticate" aphids which secrete a sweet liquid when they are "milked" by stroking. The butterflies imitate this stroking movement and also obtain sugar. The caterpillars of these butterflies even consume and destroy some of the aphids, but the ants do not attack them. The reason for this extraordinary tolerance is the allomones which chemically suppress the aggressiveness of the ants (→ hormones, → pheromones). With the exception of glycine, all amino acids possess one or more asymmetrical carbon atoms. All of them, except glycine, are therefore also optically active. This means that they are either left-handed or right-handed. L and D structures cannot be superimposed, even when rotated through 180°. It should be emphasized that only 20 out of a large number of chemically possible amino acids are present in the proteins of all living organisms. It is also noteworthy that all 20 of these amino acids are of the L form. This is difficult to explain in terms of evolution. The sequence of the amino acids in the protein chains determines their secondary and tertiary structures and whether they function as → enzymes or → hormones. General: When it is difficult or impossible to explain a concept, one compares it with something that is well known. Example: Jesus used parables to explain the unknown kingdom of heaven in terms of everyday events. In biology: Similarities in the functions of organs of different life forms: When organs and structures of different organisms perform the same function, they are called → homologies or analogies in evolutionary terms. Evolutionists often infer that different organisms have common ancestors when they exhibit similar structures; such similarities are called homologies. On the other hand, analogies are not regarded as indicative of a common descent. An example of the latter is the gills of fishes and the lungs of mammals. Their structures are quite different, but they perform the same function, namely to absorb oxygen, so that common descent is not assumed in this case. Other examples of analogies are the digging claws of moles and of mole cricket (gryllotalpidae), and the wings of birds and insects. (Greek ánthropos = man): A subdivision of biology specially concerned with human beings. → Phylogenesis, → ontogenesis, and the geographical variability of human races are studied. (purposefulness; the deductive aspects of information; Greek apóbainon = conclusion, result): The highest of the five levels of information (→ statistical, → syntactic, → semantic, → pragmatic, apobetic). It entails the purposefulness of information. The present author introduced this term in 1981, because it implies that the sender provides the purpose, the plan, or the design in order to obtain certain effects in the recipient. This is the highest and most important aspect of information, because it deals with the purpose of the sender. In every case where information is transmitted, the question should be, "Why does the sender transmit this information, and what effects does he want to achieve in the recipient?" (Latin for pre-established; from before): Refers to assumptions, concepts, or postulates that are not based on experience or observation. They have been logically contrived, or established without proof. On the other hand, "a posteriori" means that a conclusion has been reached after an orderly sequence of chronological, logical, or abstract steps. (Greek axíoma = fundamental theorem): A postulate which is stated peremptorily and is supposed to be clarifying and undeniable, although it cannot be proved. Any proof relies on one or more unprovable axioms. A mathematical example: If two values are equal to a third one, then they are also equal (i e if a = x and b = x, then a = b). This is a psychological school of thought. In its original form, only objective, measurable behavior is recognized. Concepts like consciousness, soul, and emotions are ignored. All types of behavior, including speech and thought, are regarded as a question of stimulus and response. The science dealing with chemical changes in living organisms (e.g., metabolism, respiration, digestion). The following problems have thus far been resolved: the structure of proteins, the most important metabolic reactions, the structure and functioning of vitamins and hormones, and the biochemical aspects of heredity. (Greek bíos = life; -genes = causing): Derived from or produced by living substances. basic law (the theory of recapitulation): This theory was elevated to a law by E. Haeckel (1866). According to this view, the development of an organism briefly recapitulates (repeats) the genetic history of the species. This idea was already formulated before Haeckel's time: In 1821, Meckel referred to the similarity between the development of an embryo and of an animal type. In 1828, K.E. von Baer expressed a similar view, as did F. Müller in 1864. It was assumed that the gill slits of fish appear during the development of the embryos of the higher vertebrates and of human beings, thus partially repeating their → phylogenesis. This was regarded as a strong argument in favor of evolution. Research has disproved this view, but it is still propagated by evolutionists as a basic principle. (Greek bíos = life, topos = place, position): The typical ecological niche of colonies of animals or plants or even of single kinds, delineated by circumstances like temperature or soil properties. (Greek katálysis = solution): A substance which enables, accelerates, or retards a chemical reaction. It is usually required in small quantities only, and because it does not participate in the reaction, it is not changed. Most technical chemical procedures rely on catalysis, as well as those within living cells. Example: Cells produce → enzymes which are → proteins and which greatly accelerate slow chemical reactions. (Greek chroma = color, soma = bodies; i.e., particles made visible by means of coloring): Chromosomes are wiry organelles found in the nucleus of all cells. All body cells have twice as many chromosomes as the reproductive cells. The latter are → haploid (single), whereas body cells are → diploid (double). Chromosomes are never formed anew, but result from the replication (doubling) and complementary division of the available chromosomes. It is clear that there is practically no connection between the number of chromosomes and the complexity of an organism. The reason is that chromosomes can be either long or short, and can therefore carry more genes or less. In informatics, a code is defined as a correspondence (mapping) between one set of symbols and another. In general, a code is the allocation of one kind of symbols to another kind, or to some aspect of reality, like physics, chemistry, or common events. This correspondence is based on a unique, voluntary prescription or convention. All code sequences are derived from an intellectual process, and can therefore not be ascribed to material causes. All codes represent something else (→ information). For example, the triplet GCA represents alanine, but it does not cause alanine to be formed. All coding sequences are based on a certain plan. For this reason, one may decide, purely at the coding level, whether any given system derives from a creative intellectual activity, or whether it has a material cause. (Latin complementum = increased completion, supplement): Mutually complete. Complementary angles add up to 90°; superimposed complementary colors result in white, e.g., yellow and blue; red and green). (Greek kosmos = order, beauty, universe): It is a branch of astronomy which considers theories about the structure of the universe. The distribution of matter in space and their relative motions are investigated. Using known physical theories and local astronomical data, it is endeavored to devise a complete theory about the properties of the entire universe. This has not yet been indisputably successful. (Greek kybernetike, téchne = the art of steering): Norbert Wiener (1894–1964), an American mathematician, employed this term to describe scientific researches dealing with the automatic controlling and steering mechanisms of various (biological, technical, or sociological) systems. Widely diverse fields of research have thus been combined. Technical theories which were originally developed in the study of communications and the flow of information between the different elements of a system are employed to better understand and explain non-technical phenomena. (Latin Deus = God): The belief in a personal, supernatural God who created this world and all its (physical) laws, but who has no influence on world events, on history, or on individuals. This unbiblical idea originated during the "Enlightenment" of the 17th and 18th centuries. Adherents consequently believe that God could not have revealed himself. This contrasts strongly with biblical doctrine. Deism originated in Britain during the 17th century as the "religion of reason" (Cherbury, Toland, Collins, Tindal, and Hume); it soon flowed over to France (Voltaire), and reached Germany in the middle of the 18th century (Lessing, Mendelssohn). (Latin determinare = pre-established, delineated): The doctrine that all events have been pre-determined; everything is a question of cause and effect. In the earlier mechanistic view of the universe, all physical processes were regarded as computable. All events based on matter and motion were subject to a strict mechanical process of cause and effect. Modern quantum physics has rejected this general assumption and principle. (Greek dichotomía = divide into two parts): Man is regarded as consisting of two parts, body and soul (a → trichotomy comprises a contrary view). (= deoxyribo-nucleic acid): The nucleic acids are of paramount importance among the various building blocks of living cells. They contain → genetic information, and they have the ability to implement this information in cells. In 1953, Watson and Crick deciphered the structure of DNA and showed that these molecules are able to effect replication as well as storing and releasing information. According to the Watson-Crick model, DNA molecules comprise two strands of poly-nucleotides wound round another in the shape of a double spiral. Connected by hydrogen bridges, the orientation of all pairs of bases is perpendicular to the axis of the right-winding spiral (or helix). The sequence of the bases in one of the two strands of the spiral automatically determines the sequence in the other one, because the "chemical letters" only occur in complementary pairs: adenine with thymine, and guanine with cytosine. For this reason, the molecular ratio of adenine to thymine is always 1:1, as is the ratio guanine: cytosine. And the total number of the "letters" A + G is the same as C + T.
Dimensions: The diameter of the DNA molecule is 2 nanometers (2 thousand millionths of a meter, 1 nm = 10-9 m), and the distance between the members of one base pair is 0.34 nm. Consecutive pairs are rotationally staggered by 36°, so that one complete revolution comprises 10 pairs and a vertical increase of 3.4 nm. The total length of a molecule of human DNA is approximately 8.9 feet (2.7 m), and the average length for each of the 46 chromosomes is nearly 2.4 inches (6 cm) (270/46 = 5.87 cm). DNA molecules are extremely thin, the thickness to length ratio being 1:1.35•109). If the diameter of a model of a DNA molecule is 39 inches (1 m), its total length will be 839 million miles (1,350 million km)—3,840 times the distance from the earth to the moon (which is 238,606 miles or 384,000 km) or nine times the distance to the sun (1 astronomical unit = 149 597 870 km). A molecule of DNA consists of millions of atoms which vibrate and swing continuously; some movements even resemble breathing. The frequency of vibration falls in the same range as the electromagnetic spectrum from radio waves to infrared radiation. When a DNA molecule splits up, it rotates at a speed of about 250 revolutions per second, and ten thousand "letters" can be copied in a second. (Latin duo = two): "Twoness," polarity, opposites; the idea that the world is governed or guided by two opposing realities or principles (e.g., light and darkness, good and evil, God and the devil, spirit and matter). The totality of the interactive relations between an organism and its environment (nutrition, reproduction, and the predator-prey law). In the present ecological niches, environmental conditions allow the survival of certain kinds of animals or plants. (Greek en = in; zyme = yeast): → protein. (bacteria living in human intestines, named after the discoverer, the German pediatrician Theodor Escherich, 1857–1911): These bacteria have been studied most often, and are therefore the best known. Their size is about one thousand millionth of a cubic millimeter (10-9mm3), 500 thousand million of them weigh 1 gram, and they are two thousandths of a millimeter long (2•10-6m). Each bacterium, being a single cell, contains two million protein molecules of 1,850 different kinds. The chromosomes are ring shaped and consist of more than three million base pairs. One bacterium can divide into two in about 45 minutes, and, under favorable conditions, within 20 minutes. Six rotating electrical devices working at 0.2 volts can propel a bacterium at a speed of 0.2 mm per second, which is 65 times its length. A comparable speed for a human being would be 249 mph (400 km/h). (Latin explicitus = unfold): Expressed clearly; all aspects of a matter are clearly indicated. Opposite: → implicit. (Greek génos = generation, type, descent): Inheritable factor; the smallest material unit which determines heredity; it is located in the chromosomes. Each gene is responsible for the synthesis of a specific protein, and the genes determine the characteristics of the individual. Genes can be replicated; they are arranged in a linear sequence in the chromosomes, and consist of → DNA molecules. The genetic → code is the sequence in which the 20 amino acids occurring in all living organisms, are arranged in → triplets. A triplet is a word consisting of three letters. The genetic code employs an "alphabet" of four chemical "letters," namely adenine, guanine, cytosine, and thymine. The information stored in the nucleic acids. They are essential for the operation of all processes in living cells, and are transmitted unaltered to the next generation of cells when cell division takes place. This identical replication of genetic information is the reason for the constancy of the information carried by the genes and the → genomes in all cells, and for the constancy of heredity. Genetic information plays a centrally important role during the development and growth of individual organisms (→ ontogenesis). (Greek génos = generation, type, heredity): The single (→ haploid) set of chromosomes of a cell and the genes they contain. (Greek geo = earth): The science dealing with natural physical phenomena on and inside the earth. Effects deriving from space, especially from the sun and the moon, are also studied. Geophysics include meteorology (study of the atmosphere), hydrology and oceanography (study of water and the oceans), as well as actual earth studies, like the gravitational field of the earth, the earth's magnetic field, and the internal structure of the earth. (Greek haploeides = simple): Refers to cells or organisms having only a single set of chromosomes. Examples: sporozoa (single-celled organisms which propagate by means of spores) and some plants, but also the reproductive cells of mammals. The opposite is diploid = two sets of chromosomes. The body (corporeal) cells of mammals and plants are examples of diploid organisms. (Latin hiatus = chasm, gap). (Latin homo = human being): "Human-like," representing existing or extinct human races. (Greek homología = similarity): Similar structures of living organisms (→ analogy). Used in biology as a criterion for investigating and comparing organs and parts of organs according to their structure. In the evolutionary view, homologous organs appearing in different organisms indicate that they were derived by descent from one single organ. It is, for instance, believed that the wings of birds, the anterior fins of fish, the front legs of mammals, and human arms all stem from a single common primeval organ. (Greek horman = drive, cause to move): Chemical substance secreted internally into the bloodstream by a gland. They are essential for the proper functioning and coordination of biochemical and physiological processes. The required quantity is of the order of a millionth of a gram. Both the nervous system and the hormones are responsible for the harmonious functioning of all the cells and organs in the human body and in animals. Hormones are carried in the bloodstream to all parts of the body, but they only affect specific organs. This depends on certain properties of the receptors. The quantity of hormones circulating in the blood must always be at the correct level to ensure proper health. Approximately 30 substances, some of which have complex chemical structures, are required continually or periodically for controlling nearly all physiological processes, in humans as well as in all vertebrate animals. (Greek hyper = above): Manfred Eigen, a German evolutionist, proposed the idea of a hypercycle, a molecular complex comprising at least two → RNA molecules and two → enzymes. It can supposedly act as a → catalyst for the replication of molecules (the making of identical copies). The hypercycle is regarded as a feedback loop by means of which RNA molecules and enzymes mutually encode one another, resulting in replication. Hypercycles have however not yet been detected experimentally. (Latin implicitus = complicated): Included. Opposite: → explicit. The name of this young science is a combination of information and techniques. It deals with information processing, including computer applications, and the study of non-technical information systems like linguistics and neuron networks. 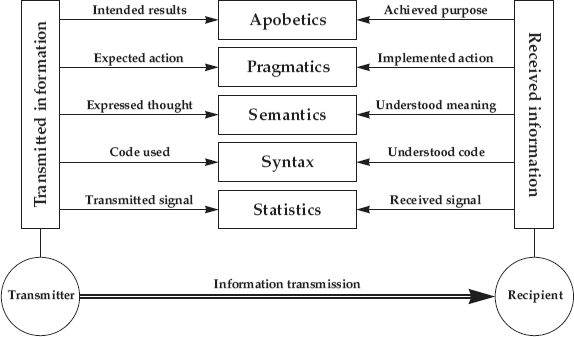 The five-levels-principle: A complete description of the concept of information includes the five aspects: statistics, syntax, semantics, pragmatics, and apobetics. And all these aspects are vital for both the originator and the recipient (see Fig. 2, p 132). The code principle: Information is established (= formulated, transmitted, or stored) by means of a unique code. An agreed upon set of symbols is used (e.g., the alphabet) to form words (→ code). The words have conventional meanings, and they are combined into sentences according to established grammatical rules (syntax) for the purpose of conveying semantic (meaningful) information. The representation principle: According to our definition, the representative function is a very important characteristic of information. Information can never be the thing itself. The encoded symbols only represent the object or the event. The sequences of letters in a newspaper represent the previous day's events. History is described in words long after the actual events, and the politicians who are mentioned are no longer with us. The → triplets in → DNA molecules represent certain amino acids, but the acids themselves are not present. They will only be formed later according to the encoded information. To avoid misunderstanding, it should be emphasized that the process of acquiring information through observation falls outside the scope of our definition. When a painting is contemplated, when a star is observed through a telescope, or when the structure of a crystal is studied by means of a microscope, one obtains information by direct observation. The real world itself is studied, and there is thus no question of an encoded representation. Our definition only covers coded representations of events or objects, which are not themselves present, or abstract ideas, which are transmitted through space and/or time. The representation principle only holds for encoded correspondences or mappings. In all such cases, there must always have been a person who established this free allocation of codes to some aspect of reality. In this sense, information always requires an intellectual originator. The theorems mentioned in chapter 6.1 have been derived from experience, like all natural laws. They must verify themselves in the real world around us. If no contradictory experiment or example is found, then they become natural laws. Natural laws are significant in that they can be applied to unknown cases. The first moon landing was possible because various natural laws were employed when the voyage was planned and computed. Calculation of the required energy was based on the known laws of energy. Although this law had never before been used for a flight to the moon, its validity was accepted. And it turned out that this trust was justified. The laws of informatics as expounded here, can be regarded similarly. Once they have been established and justified, they can be applied generally, even to unknown cases. They have been publicly proved, because these information theorems have been justified uncountable times in practice and have not been contradicted experimentally in any laboratory anywhere in the world. The information contained in the cells of all living beings falls inside the domain of the above definition, and the theorems can consequently be applied directly. It follows that such information necessarily requires an intellectual originator. Who this source is cannot be established within the framework of these theorems, since we have reached the boundary of scientific endeavor. Figure 2: The essence of information: Any piece of coded information must have originated in a person (the sender) and is meant for somebody (the recipients). Five inherent levels can be distinguished. On the highest plane, the apobetic level, the purpose and the result of information are found. The second level entails the expected action as well as the resultant activity (pragmatics). The expressed idea and the understood meaning (semantics) occur at the next lower level. And at the fourth level, the syntax involves the codification and decoding of the thoughts. The technical and statistical aspects of the actual transmission are found at the lowest level. All five levels clearly and specifically involve both the sender and the recipients, and every single level is a prerequisite for every other one. If a failure occurs at any level, the intended purpose cannot be attained. (the theory of Eccles; the Latin prefix inter means "between" in this case): The actions of persons or components which mutually influence one another. Speech is the most important form of human interaction. According to the interaction theory proposed by John Eccles, a Nobel prizewinner, there is a mutual interactive relation between man's brain and his spirit. This means that information is being interchanged between the two. Eccles makes a clear distinction between the brain as a physical component, and the unique non-material spirit. In this way, he established that human beings have a non-material part, contradictory to materialistic philosophies. All systems of expression (language, calculus) which can carry meanings (intellectual substrates, thoughts, non-material contents of consciousness), are known as languages. Information can only be transmitted and stored by means of language. The information itself is completely independent of the actual transmission system employed (acoustic, optical, or electrical), and it also does not depend on the method of storage (brain, book, compact disk, electronic data processing system, or magnetic tape). This invariance of information is the result of its being non-material. Natural languages used for interpersonal communication. Artificial languages (e.g., Esperanto), sign languages like that used by deaf persons, flag codes, and traffic signs. Formal artificial languages: logical and mathematical calculus, chemical symbols, musical notation, algorithmic language, programming languages like Ada, ALGOL, BASIC, C, C++, COBOL, FORTRAN, Pascal, PL/1. Special technical languages: Building and construction plans, circuit diagrams, and switching diagrams used in electronic design, hydraulics, and pneumatics. Special languages employed by living organisms: → Genetic codes, bee dances, → pheromones used by various insects, hormonal language, web signals of spiders, language used by dolphins, instincts (e.g., the migratory flight of birds, the migrations of salmon and of eels). The latter should rather be referred to as communication systems. All languages employ defined sets of characters where the single symbols or the elements of speech are provided with fixed, conventional rules and meaning allocations. All languages contain units or forms (like morphemes, lexemes, expressions, and even entire sentences) which serve as conveyors of meaning. Meanings are internal lingual allocations agreed upon by both sender and recipient. The following resources are involved in the meaningful codification of human languages: Morphology, syntax (grammar, style), phonetics, intonation, and gesticulations, as well as numerous semantic resources (e.g., homonyms, homophones, metaphors, synonyms, antonyms, paraphrasing, anomalies, and irony). All communications between senders and recipients entail the formulation of the symbols (sememes; Greek sema = symbol) by means of a certain language and their subsequent comprehension. During the formulation stage, the information to be transmitted is generated by the thoughts of the sender according to a suitable system (language). In the comprehension process, the recipient analyzes the set of symbols and converts them into the corresponding ideas. In accordance with the most general notions, we mean by senders and recipients, either intelligent beings or systems designed by intelligent beings. (Greek makro = long or large): A molecule comprising a large number of components arranged in chains or as interlinked networks. Very many natural and artificial molecules are macro-molecules (e.g., cellulose, → proteins, → DNA, polyethylene, and nylon). Biological macro-molecules mostly occur in the form of linear chains (DNA, proteins). (Latin margo = edge): Situated at the edge. It often refers to notes along the edges of a document or a book. (Greek meiotis = decrease in size): Meiotic division, division when ripe, or a reduction; this process of cell division takes place in two stages when germ cells become "ripe" during sexual reproduction. Two consecutive nuclear divisions result in the reduction of the set of → diploid chromosomes. (Greek mikrós = small): The biology of microorganisms, comprising bacteriology (study of bacteria), mycology (fungi), phycology (algae), protozoology (unicellular protozoa), and virology (viruses). Manfred Eigen, Berd-Olaf Küppers, and other evolutionists assume that Darwinistic evolution must take place at the molecular level. Their purpose is to describe the origin of life as an exclusively physical-chemical process occurring among molecules. In this way, life is erroneously regarded as a purely materialistic phenomenon. This term has been proposed by Carsten Bresch, a German geneticist who supports the doctrine of evolution. He regards evolution as a succession of increasingly more complex samples or models. Eventually all forms of life on earth will be united in a gigantic "intellectual organism"—the "monon." This is supposed to be the final result of the all-inclusive integration of the evolution of a planet. The monon is a gigantic historically developing monster consisting of biologically organized matter, and which comprises a supra-individual totality. 1 Mpc = 106 pc. As a light year, a parsec (parallax second) is an astronomical unit of distance. It is the distance at which 1 AU (astronomical unit = the distance from the earth to the sun = 149,597,870 km) subtends an angle of one second (1" = 1/3600 degree). So 1 pc = 1 AU/tan(1") = 30.857•1012 km. It follows that 1 pc = 206 265 AU = 30,857 billion km = 3.2617 light years. (Greek mitos = strand or string): Mytotic division, indirect nuclear division, equal division; the process of cell nucleus division where two daughter nuclei are formed from one. They contain exactly the same genetic material as the "mother" nucleus, as well as the same number of chromosomes, while the process of → meiosis results in half as many. Body cells divide mytotically, but reproductive cells divide by means of meiosis. Of a supposedly evolving system in an → ecological niche. (Greek óntos = living being, génesis = birth, origin, creation): The growth and development of an organism from conception until it is a sexually mature individual. Ontogenesis is a purposeful process controlled programmatically by the inherent genetic information and the pre-ordained organic totality. In contrast, such guiding information is completely lacking in → phylogenesis. (Greek peptós = cooked, digested) : → Protein. (Latin, automatic continuous motion): An imaginary machine that can run and work continuously without any input of energy. Since the law of conservation of energy has been generally accepted as a natural law, it is realized that such a machine is impossible. (Greek phylon = tribe, generation; génesis = origin): The supposed evolutionary development of living organisms from single cells to human beings. Compare → ontogenesis. Some snakes possess special organs which can detect heat at a distance. The rattlesnake (Crotalus spec.) has two such organs located between its eyes and nostrils on both sides of its head. Their diameter is approximately 3 µm and they are covered with nerve-rich membranes which are 15 micrometers (= 0.015 µm) thick. This pair of heat sensitive organs resembles concave mirrors, so that the direction of a heat source can be ascertained accurately. They are so sensitive that differences of a few thousandths of a degree can be detected. Together with the direction-finding capacity, this enables snakes to locate their prey in the dark. (Greek pleistos = most, + kainós = new, recent): A supposed evolutionary-geological era in the history of the earth. It is a subdivision of the Quaternary era, and precedes the Holocene; it includes the ice ages. The Pleistocene era supposedly lasted from two million years ago to ten thousand years ago. (the behavioral aspect of information: Greek pragmatiké, téchne = the art of doing the correct thing): The fourth of the five information levels (see Fig. 2) (→ statistical, → syntactic, → semantic, pragmatic, → apobetic). The question of the purpose of the sender does not arise in the three lower levels. Through every act of transmitting information, the sender intends to affect the behavior of the recipient in a certain way. To obtain the desired effect, the sender has to consider the way in which the recipient could be compelled to act according to the planned purpose. The concept "pragmatics" expresses this aspect of behavior. In everyday life, it is insufficient to simply string some sentences together; no, we formulate requests, complaints, questions, prompts, threats, commands, appeals, etc. to try to elicit the required behavior. W. Strombach defined information as a structure which causes something to happen in the receiving system, thus emphasizing this important aspect of behavior. The actions of the recipient are based on information that has previously been assembled by the sender with a specific purpose in mind. (Greek protos = primeval matter): Proteins comprise one of the large groups of macro-molecular substances. Just as cellulose provides the structural elements in plants, so proteins perform a similar function in animals and human beings. Not only does each kind of animal or each human race have distinctive proteins, but each individual person or animal has unique proteins which are recognized as foreign material by others of the same kind and are consequently rejected (immune reaction). Many special proteins having distinctive functions, occur in all living organisms (plants, animals, and human beings); they are known as → enzymes. Enzymes are → catalysts which control and steer growth and metabolic processes, as well as all the reactions involved. Proteins are → macro-molecules formed by the concatenation (joining of chains) of → amino acid residues. Two amino acids form a dipeptide, three form a tripeptide, etc, and many of them comprise a polypeptide. Some compounds consisting of relatively few building blocks are known as oligopeptides, but when there are 50 or more components, they are called proteins. Most of the proteins occurring in living organisms consist of hundreds and even thousands of amino acid building blocks. The kind of protein depends on the specific sequence of the amino acids in the chain, as well as the length of the chain. When a chain has a length of 100, the 20 different amino acids occurring in living beings can be arranged in 20100 = 10130 different sequences. This means that the total number of different proteins that can possibly be formed exceeds the estimated number of atoms in the universe. The human body alone contains more than 50,000 different proteins. This is the living substance of which all human, animal, and plant cells are made. All metabolic processes take place in the protoplasm. In the process of sexual reproduction, genes of the two parents are arranged in new combinations, so that a different mix of the individual characteristics of the parents appear in each off spring. (= ribo-nucleic acid): A macro-molecule that is similar to → DNA, but consists of one strand only. It is however known that some viruses contain two-strand RNA which has a double helix structure similar to the Watson-Crick model for DNA. Various different RNA molecules which perform certain tasks in cellular metabolism exist. (the meaningfulness of information; Greek semantikós = significant, characteristic): The third of the five conceptual levels of information (→ statistical, → syntactic, semantic, → pragmatic, → apobetic). Grammatical rules of syntax together with strings of symbols are required to establish information. The most important aspect of transmitted information is however not the selected code, nor the size, number, or shape of the symbols (letters). Neither is it the method of transmission (writing; or optical, acoustic, electrical, tactile, or olfactory signals). No, the actual meaning of the message (the semantic aspect) is of vital importance (semantic). This central aspect of information, its meaning, does not, however, play any role in the storage and transmission of the information. The cost of a telegram does not depend on the gravity of the message, but purely on the number of words used. However, the central issue for both the sender and the recipient is the meaning of the conveyed message; it is this meaning that turns the set of symbols into information. A significant aspect of any piece of information is that it originates with somebody and is intended for somebody. Both a sender and a recipient are always involved in all cases of information transfer. We can thus conclude that information must always have a meaning (semantic level). And because meaning is an intellectual concept, we may further conclude that all information must have an intellectual or spiritual source (sender). (Latin singularitas = being unique or alone): The peculiarity or uniqueness of an event or of a process. Used in mathematics for a certain point on a curve or on a plane where a situation occurs which differs from the normal behavior of that curve or plane. The lowest of the five conceptual levels of information (statistics, → syntax, → semantic, → pragmatic, → apobetic). The statistical aspect of information allows us to describe quantitatively those properties of languages that are based on frequency of use. It is of no concern whether a string of symbols conveys any meaning or not. The question of grammatical correctness is also completely excluded at this level. When a set of symbols is essentially a statistical sequence, i.e., when it is the result of a statistical process, or a purely physical or chemical process, it cannot be regarded as information in terms of our definition. Many insects (e.g., cockroaches and locusts) possess very sensitive organs for detecting vibrations of the surface on which they stand. This organ (= the subgenual organ), consisting of complex sensory cells, is located in the legs; it can detect extremely small vibrations of the surface. (the theory of the structure of sentences; Greek syntaxis = arrangement): This is the second of the five conceptual levels of information (→ statistical, syntax, → semantic, → pragmatic, → apobetic). Every language has very definite rules which underlie the grouping of symbols into words and sentences. These rules are based on established conventions. On the syntax level, a set of symbols is required for conveying information. Most written languages employ letters, but for other purposes very many diverse conventions are in use: Morse code, hieroglyphs, international flag codes, musical notes, various electronic codes, genetic codes, different stances and movements employed by bees when dancing to indicate food sources, scented pheromones emitted by insects, and hand and finger signals employed by deaf persons. Every coding system as well as the corresponding set of meanings is always based on deliberately established conventions, and both the sender and the recipient should have a knowledge of these conventions. This knowledge is either transmitted directly (e.g., as input in electronic processing systems, or by inheritance in natural systems), or must be learned (e.g., mother tongue or any other language). The syntax of a language comprises the entire set of rules which determines the ways in which the single language elements can and should be combined. (Greek telos = purpose; logos = word, doctrine): Teleology is the doctrine that everything has a final purpose, especially living beings. As in the case of building and other structures, machines, and appliances designed and built by humans, so teleology states that the purposefulness observed in all living beings and in the structure of the world, point to a purpose-giving Creator. This doctrine contradicts evolutionary thought which claims that development occurred without any purpose. C.S. Pittendrigh originally proposed that the concept of "purposefulness without purpose" should be termed teleonomy. This word is used for the evolutionary hypothesis of random chance. Purposeful processes are still recognized, but an originator of purposes is excluded beforehand. (late Latin transcendentia = transgression): Crossing the boundary between this world and the next. (late Greek trichotomía = division into thirds; tricha = threefold; tome = cut): Human beings are regarded as consisting of three parts, body, soul, and spirit (opposing view: → dichotomy). The Bible does not regard these three as separate realities, but as facets of one single person (e.g., 1 Thess. 5:23 ). (French triplet, Latin triplus = threefold): A DNA chain consists of a non-cyclic sequence of between one million and one thousand million nucleotides of which there are only four different ones (A = adenine, T = thymine, C = cytosine, G = guanine). Every three of these nucleotides (e.g., ACC, ATC, etc.) form a triplet or codon which uniquely indicate (encode) one of the 20 amino acids. The triplets are the basic words used in genetic information (→ code). (derived from virus; Latin virus = mucus, soft, poison): A complex aggregation of molecules; the simplest form of life; similar to a simple virus. (Greek kytos = sphericity, canopy): The components of a cell around the nucleus. 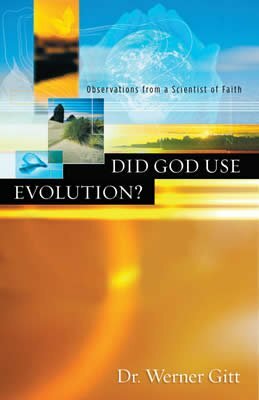 According to the view of theistic evolution, God started the process of evolution and guided and steered it over millions of years. As an information scientist, Werner Gitt critically analyzes and rejects the assumptions and consequences of the doctrine of theistic evolution.